There was music playing on an intercom system all throughout the ship, but not what you would expect. What made the whole place really the pinnacle of bizarre was the 70s rock music playing over the intercom in every part of the ship, including a little speaker in the wall of our room. Eric Clapton, Jimi Hendrix… “Everybody Must Get Stoned” was playing as soon as we got to the reception area and a middle aged British man behind me was singing along to it. The whole ship smelled old and musty. We were in a “luxury” cabin – two separate single beds, a tiny table, a very small couch, and a private bathroom, plus the aforementioned private intercom in the wall. 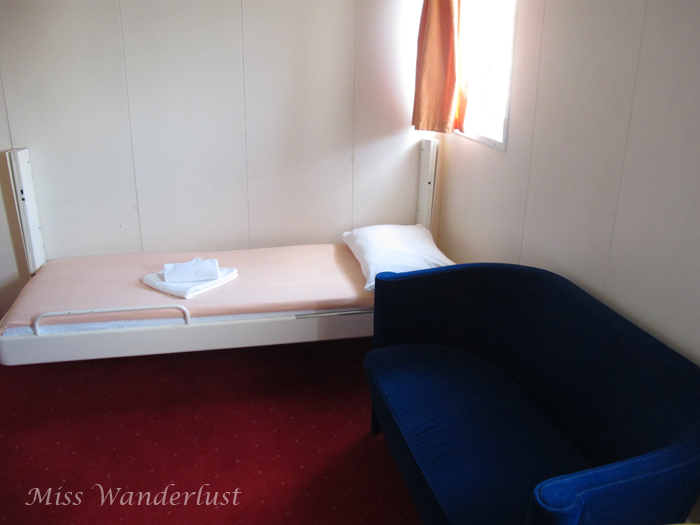 Only once we took our second overnight ferry of the trip would we realize just how luxurious this room really was. There was a TV in the room that we didn’t turn on. The colour scheme on all the signage was blue and yellow, and the way they were stylized made me feel like I was in an ancient floating IKEA. Despite taking two and a half Gravol, I didn’t have a restful sleep. The boat was rocking a lot and I could feel every wave. My whole body was moving, my head was bobbing and the curtains were rattling right above my head. We were up at 6:15 to have breakfast and get ready for arrival. The ship docked at 8:00 and we were lucky to be among the first ones off. We went through passport control and received our first passport stamps with a little ship in the corner. 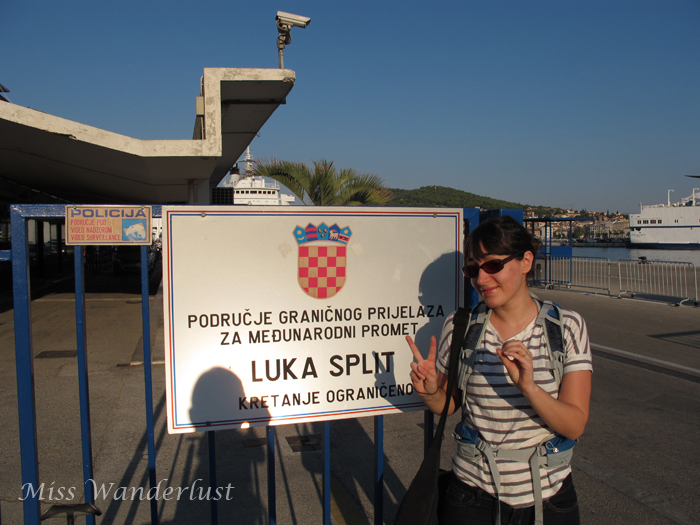 Walking off of the ship onto the Croatian shore also marked a milestone towards my travel goal – my 20th country! 66% of the way to my goal! Thanks to Dave’s directional instincts and our planning skills combined, we had no problem walking from the harbour and finding our apartment in the old town, within the palace walls. I love arriving in a new place early in the morning, when everything is clean and quiet and there are only a few people meandering about in the morning light. No crowds. Nobody rushing. Unfortunately, nobody was at our apartment to meet us. Fortunately, there was a bench outside. We asked somebody at the coffee shop downstairs to call for us and talked to the owner. After almost an hour of waiting, we finally got in, but she still needed to tidy up the room, so we dropped our bags and did a little wandering. 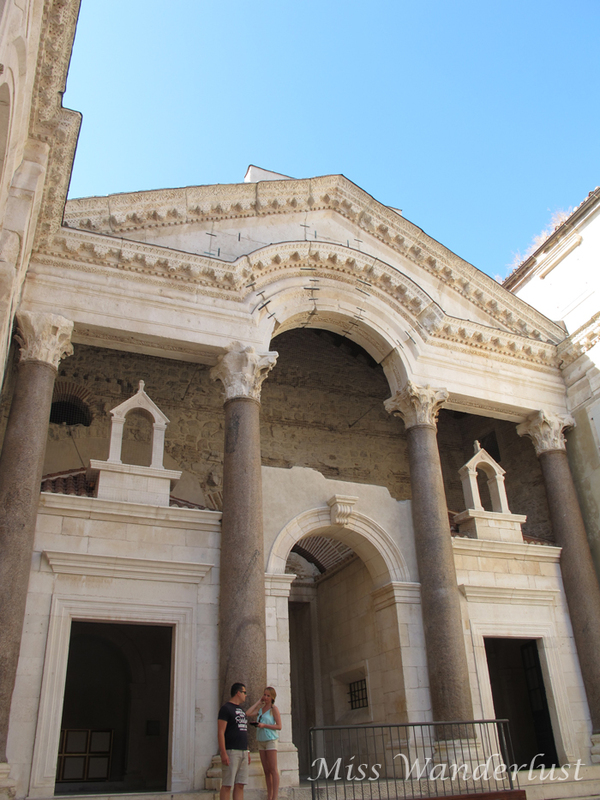 Split’s main attraction is Diocletian’s Palace, aptly named after the Roman emperor who built it in the 4th century. Much of the compact old town is actually within the former palace walls. As a UNESCO World Heritage Site, it is an impressive example of Roman architecture. 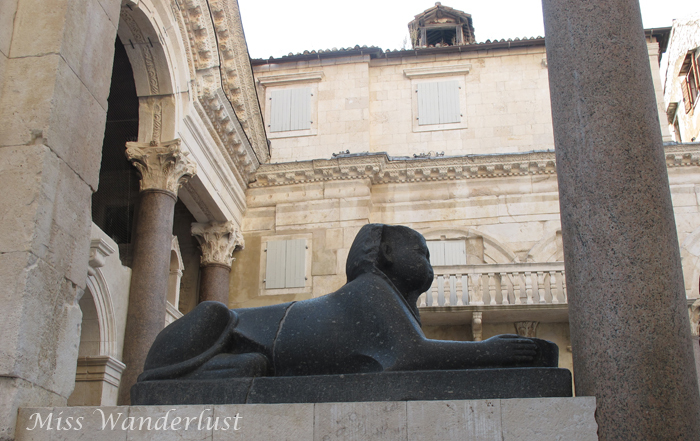 Our favourite place to hang out was the Peristyle, the former courtyard of the palace surrounded with ancient buildings, columns and 3500-year-old granite sphinxes from Ancient Egypt. During the day there are many, many cruise ship passengers in town, and the Peristyle is the ultimate place to watch nerdy tourists converge. We saw something here we had never seen before, the epitome of a tourist – a man with a Go Pro strapped to his forehead! Really?! It was the icing on the iPad photographer cake. But it was a really nice place to sit at night when the crowds have thinned out. You could order a drink or just sit and chat, listen to the musicians singing and strumming guitars, and admire the beautiful ancient buildings. 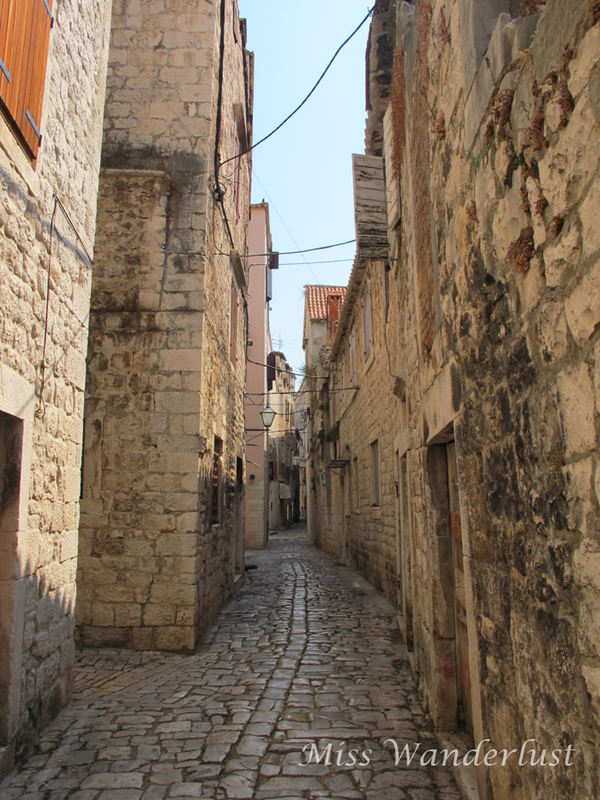 A narrow lane in Trogir, Croatia. The next day we took a day trip to Trogir, another UNESCO town about 30km away. We took an easy bus ride there and had no problem buying our tickets the same day. The old town of Trogir looks very similar to that of Split, but even smaller. We only spent a couple of hours there, just enough time to walk around the old town, have lunch, and check out the Kamerlengo Castle from the outside. 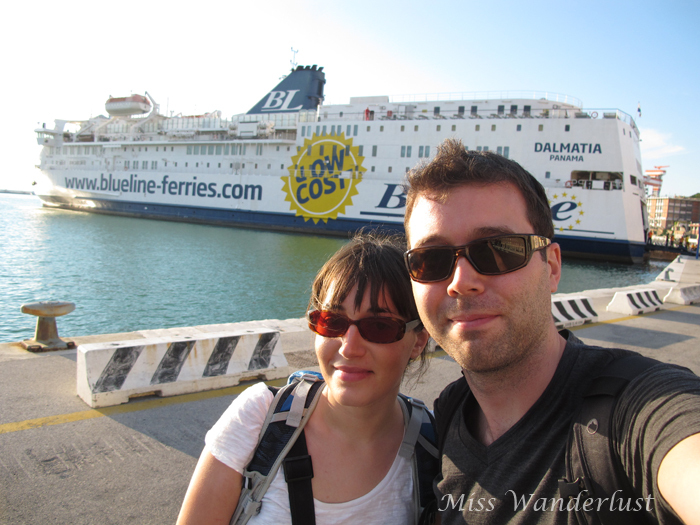 We hadn’t gotten return bus tickets yet, so we decided to try catching a boat back. We arrived at the harbour just in time to buy tickets for a small passenger ferry leaving about 10 minutes later. I usually don’t do well on boats, no matter what type, so I spent the majority of the trip laying on a bench on the top deck staring at the sky. That night we cooked dinner in our room, drank a couple of radlers and hung out at the Peristyle. The following morning we hit the road in our tiny red VW Polo (again, not what we reserved) at around 11am. 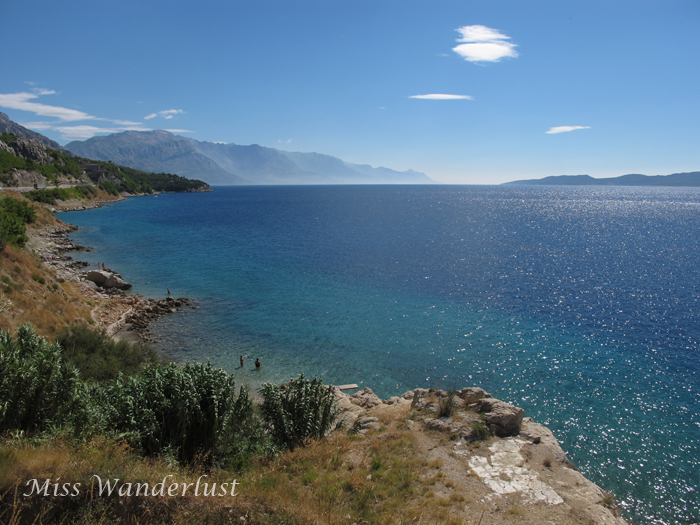 We took the road that follows the Dalmatian Coast beside the Adriatic Sea. The view was so breathtaking and gorgeous. I was so jealous of all of the people down on the beaches, floating in the water. It must have been so warm. The sky was perfectly blue. It wasn’t totally idyllic, though. Tourism in Croatia is booming, so all along the coast there was development after development – high rises, concrete apartment-style buildings, signs everywhere, and bumper to bumper traffic in some places. But we would soon be entering a completely different world: Bosnia and Herzegovina. A perfect day on the Dalmatian Coast. You did have a luxurious cabin on you low cost ferry! I love how you put all your senses to work when traveling. I vaguely recall the music on the ferry. I wish we would have spent an evening hanging out in Splits Peristyle. 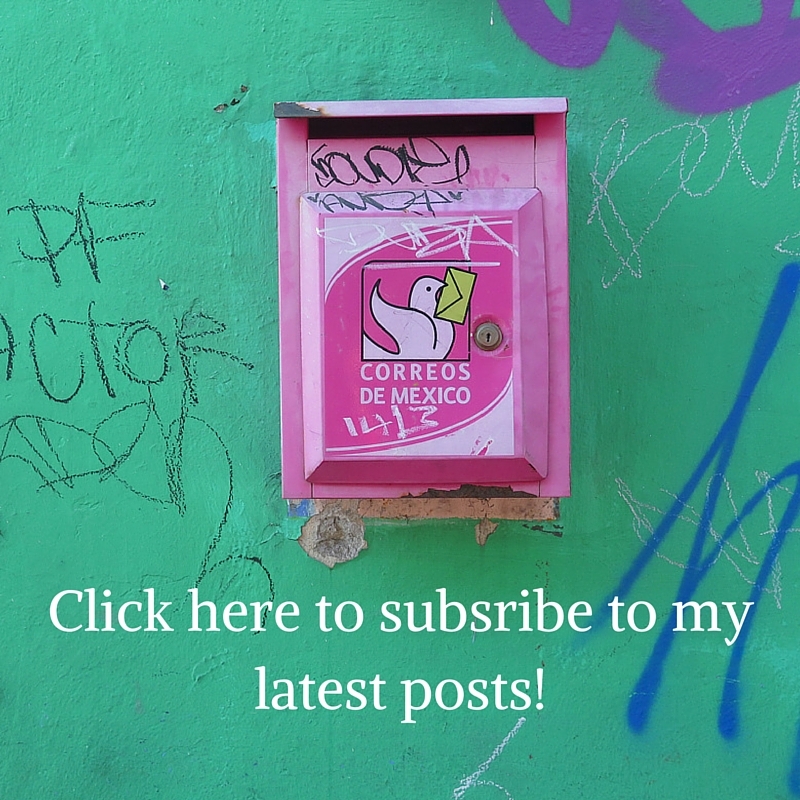 It seems to me we walked quickly everywhere without slowing to enjoy the courtyard. Your Dalmatian coast photo is breathtakingly perfect!